It costs a lot of money to run an insurgency. There are arms to buy, attacks to launch, bribes to pay. The local population has to be won over, and extensive networks have to be actively maintained, often involving members of various groups, criminal syndicates, corrupt officials, and independent operators such as local smugglers. Explosive devices have to be made, guns have to be brought in from abroad, volunteers have to be indoctrinated and trained. In 2008, the Financial Action Task Force (FATF), an international body focused on preventing money laundering and terror financing, reported that while financing individual attacks may be relatively inexpensive when set against the damage inflicted, "maintaining a terrorist network, or a specific cell, to provide for recruitment, planning, and procurement between attacks represents a significant drain on resources. A significant infrastructure is required to sustain international terrorist networks and promote their goals over time." Creating and maintaining such support and facilitation networks, FATF concluded, requires significant funds. FATF's findings have a particular relevance to Syria where terrorist and insurgent groups have established sophisticated networks in order to facilitate the movement of foreign fighters from around the world into Iraq. While the number of foreign fighters infiltrated through Syria fluctuates, these networks are especially important since foreign fighters operating in and moving through Syria have been responsible for numerous attacks on Iraqi civilians and coalition forces. Given the primary role that Iraq and Syria both play in the Obama administration's efforts to stabilize the Middle East, it is of great importance to understand the role of Syria and Syrian-based foreign fighters in the Iraqi insurgency. There is now a wealth of information available on these fighters, on their networks, and on their economic impact. The Syrian government is the longest-standing member of the U.S. State Department's list of state sponsors of terrorism, having been so designated in 1979. In February 2008, the U.S. Treasury Department underscored the findings in a collection of documents generally known as the Sinjar records. These records provide details of 700 foreign nationals who entered Iraq between August 2006 and August 2007. The records were found in October 2007 by U.S. troops at Sinjar, a small town on the Iraqi-Syrian border. The Sinjar documents identified four members of a key terrorist facilitation and finance network operating out of Syria in support of Al-Qaeda in Iraq (AQI). The Treasury Department reported that the "Abu Ghadiyah" network, named for its leader, Badran Turki Hisham al-Mazidih, known as Abu Ghadiyah, controlled the flow of much of the money, weaponry, personnel, and other materiel that passed through Syria into Iraq for the use of AQI. According to the Treasury Department, the network "obtained false passports for foreign terrorists, provided passports, weapons, guides, safe houses, and allowances to foreign terrorists in Syria and those preparing to cross the border into Iraq." Indeed, Mazidih reportedly received several hundred thousand dollars from his cousin, another member of his network, with which he facilitated travel by AQI foreign fighters and supported insurgent activity targeting the U.S. military. The Abu Ghadiyah network and others like it pump money into the local economy through the purchase of food and housing for fighters moving through safe houses. The networks additionally provide business opportunities for the local, smuggling-based economy and for bribes to local officials. The Abu Ghadiyah network reportedly maintained safe houses in Syria in Damascus and Latakia as well, investing in local economies in other parts of the country far from the Iraqi border. This has both operational and economic consequences. Foreign fighter networks in Syria, for example, have direct and indirect, and positive and negative economic consequences on the country, the government, and on various elements of the Syrian populace, from the political, social, and religious elites to locals living in towns along the Syrian-Iraqi border. There is also an impact on Iraq, as the destination for foreign fighters, and on other countries in the region as well. Developing realistic strategies to contend with these networks depends first on obtaining a broad picture of what is happening. Such a picture has to include a proper understanding of the economic impact. Countries that host networks that expedite the movement of foreign fighters risk incurring both political and economic consequences because of such activities. Ultimately, violent extremists tolerated and supported by the host country may turn against it and come to pose a threat within the country or to the regime itself. Following the October 26, 2008 U.S. cross-border raid which resulted in the killing of Abu Ghadiyah, Western journalists reported that the Syrian government cooperated with the United States in this raid. According to The Sunday Times, the Syrian regime was "complicit" in the raid because "Abu Ghadiyah was feared by the Syrians as an agent of Islamic fundamentalism who was hostile to the secular regime in Damascus." Such cooperation demonstrates the regime's willingness to crack down on foreign fighters when they threaten Syria's internal security. Doing so on an ongoing basis, however, is another matter. As an extension of foreign policy, Syria's tolerance of foreign fighter networks—and certainly its more active support for Iraqi insurgents—was intended to further Syrian interests in Iraq and deliver other non-economic benefits. 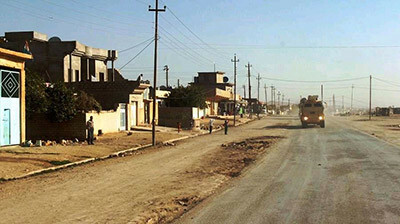 According to a Department of Defense report to Congress in March 2007 entitled "Measuring Stability and Security in Iraq," Syria has supported insurgents in Iraq for political purposes: "Damascus also recognizes that Islamist extremists and elements of the former Iraqi regime share Syria's desire to undermine coalition efforts in Iraq." As military analyst Anthony Cordesman notes, Damascus has undermined Iraq's political advancement "by providing both active and passive support to anti-government and anti-coalition forces." In one case, then-U.S. ambassador to Syria Theodore Khattouf complained to Syrian authorities that for several months a foreign fighter sign-up station was located across the street from the U.S. embassy in Damascus. In response, Syrian officials "moved the sign-up to Damascus Fair grounds—a government owned property—where it continued its work for months more." In a 2003 case, U.S. soldiers captured foreign fighters' Syrian passports. Syrian passports were provided in several instances to non-Syrians and included entry permits marked "volunteer for jihad" or "to join the Arab volunteers." That said, the huge boost to local businesses along the border with Iraq—mostly illicit, such as the smuggling of goods and persons—also benefited the Syrian regime by generating jobs and income and freeing the central government from having to invest in remote areas during difficult economic times. In the immediate term, following the fall of the Saddam regime, supporting such networks may have brought significant dividends. According to Iraqi bank records, for example, Saddam himself withdrew over a billion U.S. dollars from different accounts, and these funds were then smuggled out of the country in cash. "In Syria the money was managed by Saddam's half-brother, Sabawi Ibrahim al-Hassan al-Tikriti, the former head of the feared Mukhabarat [intelligence services]," who was considered at the time by the United States "to be the chief financial facilitator of the insurgency in Syria." every example of cooperation from Syria, there are an equal number of incidents that are not helpful … We just captured someone who was trying to escape into Syria and found out that he'd been arrested last November on the Syrian side after they caught him with a bunch of fake passports. But he bribed his way out and managed to get back in. … I don't know I necessarily attribute that to the government as to an individual Syrian border patrol unit. Clearly, drawing a line between a governmental blind eye and individual enterprise is not an easy task. But one must assume that the existence of such a volume of smuggling and human infiltration owes much to Syrian government collusion or even outright involvement. The foreign fighter pipeline in Syria is believed to have benefitted the local populations on both sides of the Syrian-Iraqi border in the form of jobs, increased cash flow into the local economy, purchase of supplies, staples, and rents. One assessment of the Sinjar documents concludes that individual Syrians would earn more than $3,000 over the course of one year as a result of these activities. This assumes that all thirty-nine Syrian smuggling contacts in the Sinjar records received an equal share of the cut from foreign fighters. Fifty-three of the ninety-three Syrian coordinators identified by name in the Sinjar records were paid by the fighters they transported into Iraq. Of these, Saudi fighters alone made forty-six payments, each averaging $2,535. As a result of being listed by the United States as a state that sponsors terrorism, the Syrian regime has long been subject to a series of sanctions, including several trade-related restrictions such as bans on arms sales and control over the export of dual-use items that have both commercial and military uses, as well as prohibitions on financial aid. According to the 2008 State Department Country Report, "despite acknowledged reductions in foreign fighter flows [from Syria], the scope and impact of the problem remained significant." In addition to the punitive measures associated with the Syrian status as a state sponsor of terrorism, Washington has taken other steps to try and ratchet up the economic pressure against Syria, taking into account not only Syrian support for terrorism but also a broader array of illicit activities. In terms of terrorism, one of the most important U.S. government actions was the 2006 Treasury blacklisting of the Commercial Bank of Syria—the major player in the Syrian financial sector—for its support for terrorism and other illegal ventures. One reason the U.S. government listed the bank as a "primary money laundering concern" is that "Treasury investigators found that the Syrian government had paid out approximately $580 million in claims to Syrian businesses [from Iraqi government funds in Syria] without the authorization of SOMO [the Iraqi State Oil Marketing Organization], and that $262 million remained frozen in an account at the Commercial Bank of Syria." In 2003, Congress passed the Syrian Accountability and Lebanese Sovereignty Restoration Act which, among other issues, cites as reasons for sanctioning the regime the fact that Syria allows terrorist groups to operate within its territory and permits the flow of goods and fighters into Iraq. Included among the findings in the legislation are the March 2003 statement by Syrian foreign minister Farouq al-Shara that "Syria's interest is to see the invaders defeated in Iraq" and the April 2003 statement by then-secretary of defense Donald Rumsfeld that "busloads" of Syrian fighters entered Iraq with "hundreds of thousands of dollars" and with leaflets offering rewards for dead American soldiers. President George W. Bush also issued several executive orders directed at Syria, which have targeted the Syrian elite for its involvement in corruption, citizens for interfering in the internal affairs of Lebanon, and former Iraqi regime elements for supporting the insurgency—some of whom were in Syria. A number of top Syrian officials were designated by the Bush administration using executive orders or other legal authority, which enabled designation and asset freezing. In addition, in response to the Syria accountability act of 2003, Bush issued an order implementing this legislation, which restricted further trade between the two countries and prohibited Syrian aircraft from landing in the United States. There is evidence that the Syrian accountability act and subsequent financial sanctions have dissuaded U.S. and some other businesses from investing in Syria. According to one report, General Electric, Mitsubishi, and the French power company Alstom all declined to bid on a Syrian government contract for the construction of power plants. Mobile telephone provider Turkcell withdrew its bid to purchase Syriatel in August 2008 after the United States sanctioned Syriatel's primary stakeholder, Rami Makhluf. Sanctions have also crippled Syria Air, the state airline, by preventing the company from purchasing parts or planes for its Boeing fleet. Meanwhile, U.S. sanctions under the Patriot Act against the Commercial Bank of Syria have deterred private Western banks from opening branches in Syria. As Syria's energy production levels decline, sanctions have also prevented major Western energy companies from making new investments there although other foreign companies have supplanted U.S. firms. One company, Gulfsands Petroleum, reportedly moved its principal office to London in order to circumvent U.S. sanctions against its local partner, Makhluf. Al-Qaeda in Iraq has long benefited from a network of associates in Syria, which it uses to facilitate travel to Iraq. In a 2003 investigation of foreign fighter recruiters operating out of Italy, prosecutors noted that "Syria has functioned as a hub for an al-Qaida network." Transcripts of operatives' conversations "paint a detailed picture of overseers in Syria coordinating the movement of recruits and money" between cells in Europe and training camps in northern Iraq run by Al-Qaeda affiliated, Kurdish Ansar al-Islam. Syrian cell leaders facilitated travel for recruits and provided them with funding while European members gave false travel documents to recruits and fugitives and monitored their travel. Some of the recruits traveling to the Ansar camps stayed at the Ragdan Hotel in Aleppo for some time and later stopped in Damascus. Indeed, the Italian investigation revealed that operatives in Europe who worked for Al-Qaeda leader Abu Mus'ab al-Zarqawi acted on the instructions of his lieutenants in and around Damascus and Aleppo. These men included Muhammad Majid (also known as Mullah Fuad), described as the "gatekeeper in Syria for volunteers intent on reaching Iraq." In 2005, the U.S. Treasury Department designated Sulayman Khalid Darwish, who was operating out of Syria, a specially designated global terrorist for fundraising and recruiting on behalf of Zarqawi's network (the Jama'at at-Tawhid wa'l-Jihad) and Al-Qaeda. Described as a member of the Zarqawi organization's advisory (shura) council and "one of the most prominent members of the Zarqawi network in Syria," Darwish forged documents, recruited and dispatched terrorists, and raised funds for the Zarqawi network. Evidence of this network's continued presence in Syria came two years later in 2007. On December 6, the U.S. Treasury Department designated seven individuals, all based in Syria, for providing financial and operational support to the Iraqi insurgency. One individual was a member of AQI and the remaining six were former regime officials representing the Iraqi wing of the Syrian Baath party. Undersecretary of the Treasury Stuart Levey insisted, "Syria must take action to deny safe haven to those supporting violence from within its borders." While in Syria, Zarqawi reportedly planned and facilitated the October 2002 assassination of Lawrence Foley, a U.S. Agency for International Development official based in Amman, Jordan. Jordanian prime minister Abu Ragheb Ali announced that the Libyan and Jordanian suspects, arrested in December in connection with the attack, received funding and instructions from Zarqawi and had intended to conduct further attacks against "foreign embassies, Jordanian officials, and some diplomatic personnel, especially Americans and Israelis." According to the Jordanian indictment, Zarqawi's group had been planning to target "American and Jewish interests as well as Jordanian security forces since 1997." The captured assassin, Salem Said bin Sewid, confessed that Zarqawi provided funding and weapons for the planned assassination. After the attack, "an associate of the assassin left Jordan to go to Iraq to obtain weapons and explosives for further operations" at a time when a Zarqawi-run network was operating in Baghdad. The operatives were trained in Syria, supplied with weapons, and instructed to return to Jordan in order to identify a target for the attack. We believe terrorist and insurgent expenses are moderate and pose little significant restraints to armed groups in Iraq. In particular, arms and munitions costs are minimal—leaving us to judge that the bulk of the money likely goes toward international and local travel, food and lodging of fighters and families of dead fighters, bribery and pay-offs of governmental officials, families and clans; and possibly into the personal coffers of critical middle-men and prominent terrorist or insurgent leaders. While some facilitators are ideologically driven members of the group or like-minded followers, others are traditional criminal smugglers who do not differentiate between smuggling foodstuffs or foreign fighters across the Syrian-Iraqi border. A West Point review of the Sinjar documents concluded, "Large groups of people—such as foreign fighters—cross the border in remote locations, often using the same tracks and trails as the livestock smugglers. In fact, the same ring of smuggling guides will often move both livestock and human beings." This untidy mix of insurgents, terrorists, professional smugglers, and corrupt government officials provides multiple opportunities for financial gain for all parties involved. Consider the case of Fawzi al-Rawi. In late 2007, the Treasury Department designated Rawi—a leader of the Iraqi wing of the Syrian Baath party—for providing financial and material support to Zarqawi's AQI. The extent of the Syrian role in Rawi's activities is noteworthy. Rawi was appointed to his position in the Syrian Baath party by President Bashar al-Assad in 2003. According to U.S. Treasury, the Iraqi wing of the Syrian Baath party "has since provided significant funding to Iraqi insurgents at al-Rawi's direction." Indeed, Treasury noted that Rawi "is supported financially by the Syrian government and has close ties to Syrian intelligence." With the authorization of the Syrian regime, Rawi twice met with a former commander of Saddam Hussein's Army of Muhammad (Jaysh Muhammad) in 2004 and told the commander his group would receive material aid from Syria. In 2005, Rawi "facilitated the provision of $300,000 to members of AQI" as well as providing AQI vehicle-borne improvised explosive devices (IEDs), rifles, and suicide bombers. In meetings in Iraq with senior AQI representatives in September 2005, Rawi and AQI leaders discussed operational issues, including attacks against the U.S. embassy and assaults in the international zone. Ultimately, a truly successful insurgency can become such a successful fundraising enterprise that it controls sufficient funds to finance activities beyond the immediate area of operations. Thus, in a July 2005 letter to Zarqawi, Ayman al-Zawahiri, Al-Qaeda's second in command, humbly asked the leader of AQI if he could spare "a payment of approximately one hundred thousand" because "many of the lines have been cut off." Additionally, the robust network can be used to transport fighters, money, and goods to other potential jihad locales such as Lebanon, Yemen, and Somalia. The implication, of course, is that AQI was by then very well funded, the result—at least in part—of large subventions arriving via Syria. One reason AQI and other insurgents in Iraq have been so successful is because their facilitation networks have successfully raised and transferred funds, recruited and transported fighters, and procured and moved weapons and goods—mostly through Syria. Shutting down these networks and starving the insurgency of its supply of materiel, funds, and manpower is a critical component of any successful counterinsurgency campaign. But convincing and enabling Syria to take the necessary steps to shut down the smuggling pipelines will require something more than just economic sanctions. As the Obama administration pursues its engagement strategy with Syria, closing the pipelines perhaps more than anything else will provide the clearest yardstick by which to measure Syrian reciprocity to the administration's outstretched hand. The United States and its allies should help provide local economies with jobs and services. Full employment and access to a better quality of services in towns and villages will act as a buffer against the losses that are sure to follow closure of the smuggling economy. This relates, in some ways, to the dilemmas posed by heroin production and smuggling in Afghanistan where the illegal revenue greatly exceeds remunerations in the local employment markets. This means that employment must be well paid, stable, and buffered against regional economic fluctuation. It also means that labor should not be ephemeral or makeshift but directed towards the development of a constantly improving local infrastructure. Employment for women may prove crucial to giving females a greater say in local issues. There is a real need for an anti-corruption drive focused on cleaning up the areas of corruption (police, border officials, the public sector in general), on building on the presidential anti-corruption campaigns of 2000 and 2003, and on leading to the creation of a permanent body dedicated to an anti-corruption drive, possibly in conjunction with Transparency International. The above campaign should be pursued along with a civil society campaign aimed at breaking the deeply ingrained culture in which members of the public offer bribes to people in authority, considering this as the cost of doing business. Diplomatic efforts must be pursued to address the underlying policy issues that have led Syria to support insurgents and terrorists as a means of furthering its domestic and foreign policy. These efforts must include educational and comparative instruction showing how Western countries achieve greater prosperity by eliminating similar forces from public and political life. Concurrent and parallel efforts should be initiated on the Syrian side of the border to match those on the Iraqi side in areas including human rights, political reconciliation, and debt relief. This will have to proceed by means of a carrot and stick approach and will depend much or entirely on cooperation from the regime. At the end of the day, however, political and diplomatic efforts may fall short, in which case targeted financial sanctions present an attractive option. Such efforts should be focused on illicit activities, on authority figures engaged in criminal or other activities threatening regional security, and on corruption. This does not close the door on engagement, focused as it is not on the regime but on illicit conduct. Indeed, such sanctions should be combined with regional diplomacy employing several countries' efforts to cajole the Damascus regime when possible and to sanction it when necessary. Sanctions can at least increase the costs to the regime of its continued, belligerent behavior. On their own, sanctions will never solve national security problems, but when used in tandem with other elements of national power in an integrated, strategic approach, they can be very effective. Were the shadow economy of smuggling enterprises to contract, the most critical and time-sensitive issue would be to jump-start successful, legitimate economic growth in its place. In the words of retired British army general Sir Frank Kitson, "The first thing that must be apparent when contemplating the sort of action which a government facing insurgency should take, is that there can be no such thing as a purely military solution because insurgency is not primarily a military activity." If not, then what is it? In the case of Syria and Iraq, it is domestic and regional power politics in almost equal measure. But it is closely linked to economics and to the financial status of individuals and communities. By blocking foreign donations on the one hand and by providing job stability on the other, it should be possible to make real inroads into a seemingly intractable problem. Matthew Levitt is a senior fellow and director of the Stein Program on Counterterrorism and Intelligence at The Washington Institute for Near Policy and an adjunct professor at Johns Hopkins University's School of Advanced International Studies. This article is derived from a paper delivered at The Foreign Fighter Problem conference of the Foreign Policy Research Institute, July 14, 2009. "Terrorism Financing," Financial Action Task Force Secretariat, Paris, Feb. 28, 2008. "State Sponsors of Terrorism," U.S. State Department, Washington, D.C., Dec. 29, 1979. For full English translations, see "Personal Information for Foreign Fighters," Harmony Project, Combating Terrorism Center, West Point, accessed Nov. 13, 2009. "Treasury Designates Members of Abu Ghadiyah's Network," U.S. Treasury Department, Washington, D.C., Feb. 28, 2008. Associated Press, Oct. 29, 2008. The Sunday Times (London), Nov. 2, 2008. "Measuring Stability and Security in Iraq," quarterly report to Congress, U.S. Defense Department, Washington, D.C., Mar. 2007, p. 17. Anthony H. Cordesman, "The Department of Defense Quarterly Report on Stability and Security in Iraq: The Warning Indicators," Center for Strategic and International Studies, Washington, D.C., Dec. 22, 2006. David Schenker, testimony in Francis Gates, et al. v. Syrian Arab Republic, et al., U.S. District Court for the District of Columbia, Civil Action No. 06-1500 (RMC), Sept. 2008. Paul Wolfowitz, deputy secretary of defense, "Helping Win the War on Terror," testimony before the Senate Armed Services Committee, Washington, D.C., Sept. 9, 2003. Richard H. Shultz Jr. and Andrea J. Dew, Insurgents, Terrorists and Militias: The Warriors of Contemporary Combat (New York: Columbia University Press, 2006), p. 240. "U.S. Cross-Border Raid Highlights Syria's Role in Islamist Militancy," CTC Sentinel (West Point), Nov. 2008. The National ( Abu Dhabi ), Nov. 2, 2008. Clint Watts, "Countering Terrorism from the Second Foreign Fighter Glut," Small Wars Journal, May 28, 2009. Brian Fishman, ed., Bombers, Bank Accounts, and Bleedout: Al-Qai'da's Road in and out of Iraq (West Point: Harmony Project, Combating Terrorism Center, 2008), p. 85. "State Sponsors of Terrorism," Dec. 29, 1979. "Chapter 3: State Sponsors of Terrorism, County Reports on Terrorism 2008," Office of Coordinator for Counterterrorism, U.S. State Department, Apr. 30, 2008. "Treasury Designates Commercial Bank of Syria as Financial Institution of Primary Money Laundering Concern," U.S. Treasury Department, May 11, 2004. "Testimony of Acting A/S Glaser on Financing the Iraqi Insurgency," U.S. Treasury Department, July 28, 2005. Syrian Accountability and Lebanese Sovereignty Restoration Act, sect. 2.31. "Rami Makhluf Designated for Benefiting from Syrian Corruption," U.S. Treasury Department, Feb. 21, 2008. "Treasury Designates Director of Syrian Military Intelligence," U.S. Treasury Department, Jan. 18, 2006. "A/S Glaser on Financing the Iraqi Insurgency." David Schenker, "The Syria Accountability and Lebanese Sovereignty Restoration Act of 2003: Two Years On," testimony before the House Committee on International Relations, Washington, D.C., June 7, 2006. Andrew Tabler, "Global Economic Crisis Boosts Utility of U.S. Sanctions on Syria," Washington Institute for Near East Policy, Washington, D.C., Feb. 26, 2009. "Treasury Designates Commercial Bank of Syria." Jeremy M. Sharp, "Syria: Background and U.S. Relations," Congressional Research Service, Washington, D.C., Mar. 11, 2009, p. 16. Los Angeles Times, Apr. 28, 2003. "Treasury Designates Individual Financially Fueling Iraqi Insurgency, al-Qaeda," U.S. Treasury Department, Jan. 25, 2005. Secretary of State Colin Powell, remarks to the United Nations Security Council, New York, Feb. 5, 2003; "Treasury Designates Six Al-Qaida Terrorists," U.S. Treasury Department, Sept. 24, 2003. The Jordan Times (Amman), July 1, 2003. Powell, remarks to the United Nations Security Council, Feb. 5, 2003. Jane's Intelligence Review, June 16, 2003. The New York Times, Oct. 28, 2003. Caleb Temple, Defense Intelligence Agency, quoted in GlobalSecurity.org, July 28, 2005. Fishman, Bombers, Bank Accounts, and Bleedout, p. 87. "Treasury Designates Individuals with Ties to Al Qaida, Former Regime," U.S. Treasury Department, Dec. 6, 2007. "Letter from al-Zawahiri to al-Zarqawi," July 9, 2005, GlobalSecurity.org, accessed Oct. 7, 2009. "Section B: Counter Insurgency Operations, Part 2: The Conduct of Counter Insurgency Operations," Army Field Manual, Vol. V, Operations Other Than War, DGD&D 18/34/56 Army Code no. 71596, pts. 1, 2 (London: Prepared under the direction of the Chief of the General Staff, 1995), p. 3-1, as cited in Bruce Hoffman, Insurgency and Counterinsurgency in Iraq (Santa Monica: Rand Corporation, 2004), p. 7. Related Topics: Syria, Terrorism | Matthew Levitt | Winter 2010 MEQ receive the latest by email: subscribe to the free mef mailing list This text may be reposted or forwarded so long as it is presented as an integral whole with complete and accurate information provided about its author, date, place of publication, and original URL.